And if you want it, baby, well you can bleed on me. 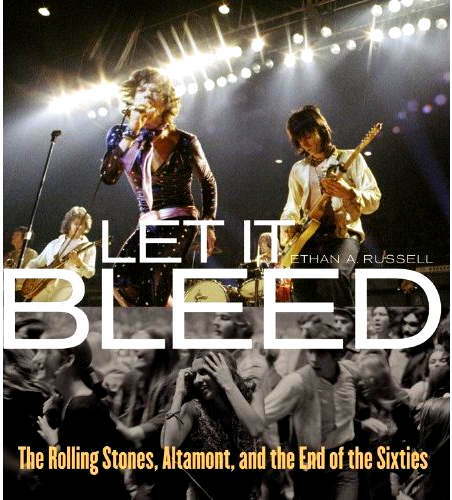 I'm the co-author of the new book, Let It Bleed: The Rolling Stones, Altamont, and the End of the Sixties by Ethan A. Russell. The lead author and photographer is my old and dear friend, Ethan Russell. His site is Ethan Russell Photographs and if you like The Rolling Stones, The Beatles, The Who, and a host of other musicians, take a look. In the meantime, I'm in New York City for a few events surrounding it's publication. Posting the resultant saving of the Republic will be light for the duration. I'll have more to say about this book in the near future, but for now I am very, very pleased at how this book turned out. But first some samples of traveling music for a trip taken long ago. And yes, I was at Altamont. They say that if you can remember the Sixties you weren't really there. My curse is that I was there and I remember everything. I think. That is a sharp looking cover. We know you can write and Russell can photo-document, so the package must be superlative. Dissection of the anomalous 60s is always pleasurable. For me, the Ben Fong Torres article in Rolling Stone was among the best contemporary jounalism at that tiem. A real slap in the face. I always knew there was a good reason I HATE the Hells Angels. Well, Russell can write too. Take it from me. the only reason you hate the hells angels is cause your to ugly and we wont sleep with you. looking forward to the book... Hey G, what do you think you forgot about the 60s? They were hired to provide security for the concert -- a poorly-planned nightmare of an event held in a terrible site, and hosting about 400,000 stoned/drunk/crazy people. Outnumbered by something like 5,000/1, and prevented from easy movement or communication by an immense sea of flesh, I can understand (though not necessarily excuse) why they overreacted -- especially when you consider that they were paid for their services in *beer*, and drank their wages before embarking on their duties. As for Meredith Hunter's death -- when this obnoxious speed freak was confronted by the HAs about the fact that he'd spent the entire concert threatening random people, he responded by unholstering a *loaded .357 Magnum* in the middle of a dense crowd, and pointing it at the Angels (check the footage in GIMME SHELTER). One of the HAs stabbed him to death; the killing was later ruled a Justifiable Homicide, given the circumstances. Again -- not to justify the Angels' excesses, but given the task of handling a half-million intoxicated people squeezed into a giant junkyard, how well would we and eighty-odd of our friends have performed? Having worked security at large festivals (not as large as Altamont!) I'm sympathetic to Mungo's description of what happened. I can't speak for the HAs, but in my case, we were just trying to get everyone out of there alive and healthy.